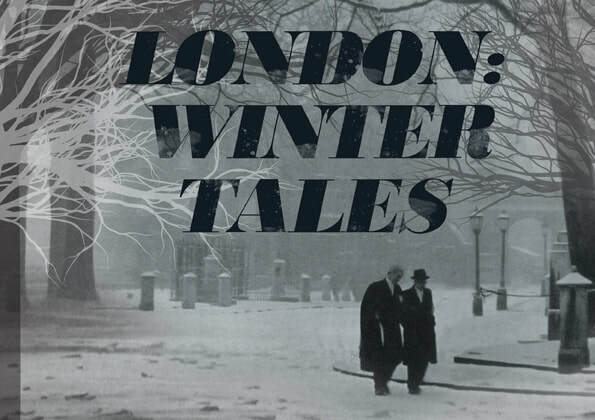 WATCH THIS SPACE FOR NEWS ON THE NEXT WINTER TALES EVENT IN 2019! It is happening! Watch this space! This was a follow-up to our first event which took place in February 2016 (two years already!). A beguilingly dark evening of spellbinding songs and enchanting words. An evening of the sorcerous and the uncanny, the other worldly and the weird. 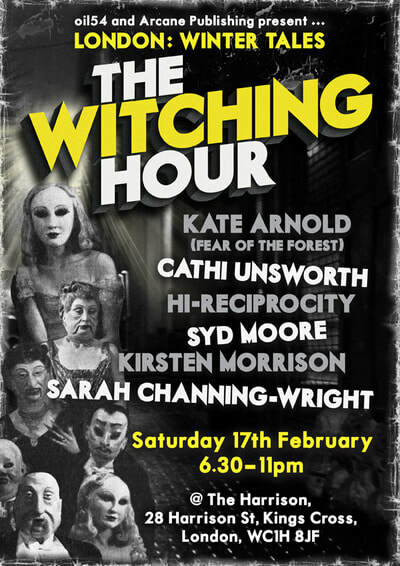 Join us for The Witching Hour! Three bewitching musical acts, three mesmerising authors. Six magical performances to thrill, fascinate and delight set in the intimate surroundings of The Harrison. 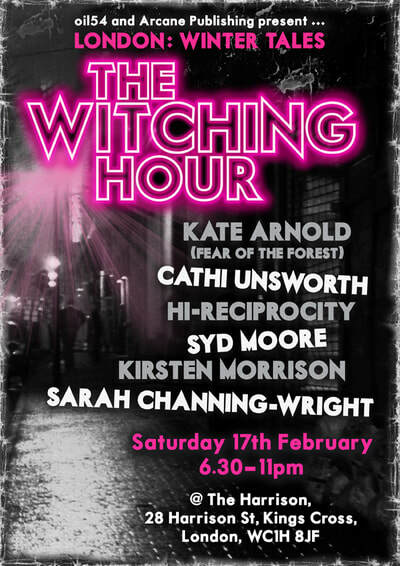 We present to you an eclectic line-up of wonderful artists, all from very different backgrounds, all with their own unique take on ‘The Witching Hour’ yet all bound by a tradition of story-telling. Welcome to The Witching Hour! The facebook event page is constantly updated, with videos, interviews, etc. Do go and have a look HERE! Cathi Unsworth began a career in journalism on the music weekly Sounds at the age of 19 and has since worked for many music, arts, film and alternative lifestyle journals. She is the author of five other novels: Without The Moon, Weirdo, The Not Knowing, The Singer and Bad Penny Blues, and the editor of the award-winning crime compendium London Noir. Without The Moon was longlisted for the 2016 Gordon Burn Prize and was The Times’ Crime Book of the Month. Weirdo was shortlisted for the Theakston Old Peculiar Crime Writing Prize. Cathi’s intriguing new novel, That Old Black Magic, is a thrilling mix of murder, magic and mayhem in wartime England – a vintage Noir novel with an occult heart, it will be published on 8 March 2018. The book also features Helen Duncan, the Scottish medium best known for being the last person to be imprisoned under the British Witchcraft Act of 1735. We are privileged to get a first glimpse of the book and the fascinating stories behind it before its official publication! Syd Moore grew up in and lives in Essex where the Rosie Strange novels are set and is the author of two mystery novels The Drowning Pool and Witch Hunt. For many years, she has been associated with books and the publishing industry. She is the former presenter of Pulp, the Channel 4 books programme and founding editor of Level 4, a magazine for arts and culture. Syd is also an activist and campaigns tirelessly to challenge the stereotypes about the county of Essex. Syd’s first two novels in the Essex Witch Museum Mysteries, Strange Magic and Strange Sight, will soon be followed by the third in the series, Strange Fascination. Syd has also just signed a new third-book contract to continue plotting the adventures of charmingly mismatched paranormal investigators Rosie Strange and her handsome sidekick Sam! Sarah was born in Exeter, UK, and is a qualified graphic designer, publisher and Egyptologist. In 1996, she escaped to London and found herself quickly drawn into the goth subculture of London. Whilst there, she was inspired by the books of Anne Rice, Poppy Z Brite and her friends in the goth scene to write a vampire story based around the scene at the time. Her debut novel, The Angels of Islington, was published in 2014. Sarah will be talking about and reading from her latest project, Gallows Cross, the story of three Devon women hanged for witchcraft in 1682. Kate Arnold plays the hammered dulcimer, violin and vocals. She is a performer, a composer, and a teacher. Kate is the frontwoman of a superb band called Fear of the Forest who deals "in dark folk tales and true stories of family murders, shipwrecks, ancient demons and modern horrors" . ​Below is a video of Fear of the Forest performing in London last November! Kirsten Morrison is a classically trained composer and singer. She has worked extensively as a freelance musician and has written and performed in many musical genres, including classical, pop, opera and theatre as well as for film, TV and radio. Hi-Reciprocity is the artistic outlet of Simon Satori Hendley (ex-Rome Burns) and a series of talented friends. The friends are as important as Simon himself as together they create melancholic folk tunes inter-spaced with wry stories. We've done it, and it was fabulous! You can view Steve Kenny's fabulous pictures of the evening HERE. "This review is purely for my own lousy memory and is not meant as a serious critique of the night or its individual acts; just a few observations and opinions. I may even have the running order slightly wrong but in summary, I loved it! It ran shockingly smoothly for a nine act show and all the work behind the scenes seemed organized, friendly and professional. Steev Burgess is a real poet: a grey haired Londoner and an artistic product of psychogeography. I’d love to find a copy of a poem he did about St.Giles but if you look around the internet you can at least find his poem about ‘Gaslight and Gin’ which similarly highlights his love of London and old worlds and old words. Joanna Vale, was the most ‘nature poet’ of the night, and Winter, the overarching theme of the event, was her natural environment. She’d arranged for a soundtrack of winter-sounds and a screen of wintry images to give her words a real three-dimensional feel as she read her work about Jack Frost and ravens and gods and even in the warm and stuffy basement we huddled together in the cold! Danni Antagonist is almost a rapper as she spits out her words with a syncopated beat and animates her tales by wrapping her hands around the consonants as she talks. She’s the most personal of the poets. Writing emotionally about universal thoughts and feelings and returning onstage during Black Violation’s performance for a wonderful duet that reminded me of Joolz Denby’s old poetry records where she borrowed much of New Model Army for her backing band. Bradley James was late and so came to the stage in a fluster. His appearance as a huge force of nature blowing through the event was probably made even more obvious by the juxtaposition of himself with the diminutive Danni Antagonist. Brad has a social conscience and an anger at the injustices around him. It was a relief however to find that this hasn’t left him without a sense of humour and the gleefully horrendous pun that forms the heart of his poem about the Serengeti Plains and the plight of the welfare state (‘Kill a Man’s Giro’) was inspired! Rosie Garland is a star. Although we talked of stagefright before either of us did our ‘turn’ her performance seemed effortless. She just talked and talked and interspaced her tales of being the ‘odd one out’ with poems and chunks of her novels about circuses and shape-shifters: freaks and performers! For someone who often defines herself by her differences to others she certainly has a natural writer’s gift of empathy for everyone. Oh, and the line ‘Up to where the dark is giddy’ is sooooo good! It’s not just the context, I just think those are a beautiful group of words to stick together! Carya Gish was at the centre of this whole affair. Not only did she put this event on with Alan Pride (with artistic help from Matt) but she also read out a sort of manifesto of her artistic aims (from a Guardian article written by Robert MacFarlane) where she praised the artists that have a sense of location and then read a section of her current novel. Like Rosie she’s defiantly writing her own work with little or no compromise to genre-restrictions, trends or marketing beyond telling the story that she wants to read. It’s the old punk ethic that infects us all. Funny hair, dubious personal-hygiene and safety pins may be the historic artefacts of punk but the spirit that underlies this and still lives on, is that of a real positive ‘Do It Yourself’ movement: if you want to make music, do it, don’t just wait for Simon Cowell to discover you, if you want to write a book, write it, don’t just talk about writing it. Publish it yourself, get it out there. Create a spoken-word event. Build a new bohemia. Don’t procrastinate or wait to be plucked from obscurity. Fame, riches, happiness and artistic freedom are all distant goals that few ever reach but you’ll get there a lot quicker if you make those first steps yourself. Hi-Reciprocity are an odd one to describe because it’s me and I’m therefore a tad susceptible to bias! I think it was pretty good. I got some nice comments from some nice people! Through luck rather than judgement perhaps, I was a clever link between the poets and the musicians, as I do a little of both and mix serious subjects with comedy and try to cram in everything I’m interested in, into a little 30 minute set. I suspect I invoked Winter almost as much as Jo Vale. I’m delighted that the new work went down well (a slightly rewritten ‘Wandlebury’ and a song I love that is called ‘Gardeners’ Questionable Time’ until I find a better name). I love the fact that Liza could join me on stage and that a few more of my friends and fellow artists could see the sort of nonsense I’m currently doing! With a few curses at forgotten lines, I’m actually rather content with my performance and can’t wait to tell you what Hi-Reciprocity is up to next! You The Living seemed a strange duo for a spoken-word night as the words are low in the mix and a fuzzy-fizzy-overdriven guitar dominates like a school bully. Amongst all the natural charismatic talkers (poets and writers) there was little friendly communication with the audience or even between band members and yet despite this… or because of this… the sounds were exquisite: falling somewhere between the soundtrack for the film ‘Last Lovers Left Alive’ and old Cranes albums, it was a brilliant and brutal noise. It was late night music for the emotionally scarred. Then Black Volition took the stage. Dogged by sound problems (the only ones of the night!) that they joked their way through, this was like going to a seedy bar in Hamburg where some women of dubious character are sniffing powders in the corner and a man is staring at you intently whilst playing with a flick-knife and there on the stage is Depeche Mode playing a secret gig of dirty jazz numbers. It reminded me of a band called Liquid Lounge Quartet. It reminded me of culture in a dark place. It made me happy! You can download the interview booklet for the evening, featuring interviews with all the artists, HERE. This event will be seated only with 45 seated tickets made available for the evening. You can purchase your tickets HERE (£10 + booking fee). READ ABOUT THE CUSTOMS HOUSE HERE.